This is what happened a few days back. I had gone to Domino’s to buy myself a taco! While I was standing at the counter and placing my order I saw two little hands trying to find their way through the crowd to get their order which had just gotten ready. I was in a hurry so I quickly placed my order and being told to wait for 15 min I started looking for a chair in the jam-packed place that Domino’s becomes on Sundays. I was unable to find any when I suddenly saw 1 chair empty at a table where these two were happily chatting and having their pizza. I asked them if I could sit there and Tuqlaq (the child on the right) was quick to smilingly say, “sure, sister, have a seat”. Sigh! It was just overwhelming. I was so deeply touched. I got to know that Tuglaq and Kasim had been saving money since the past few MONTHS to have this tiny pizza which they confessed that they absolutely loved.. 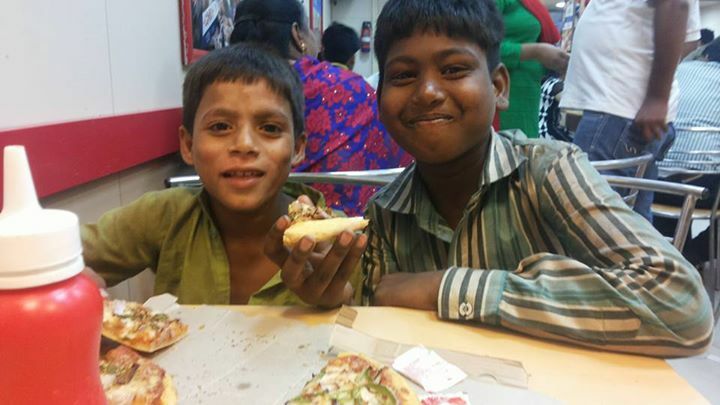 I couldn’t help but think that inspite of the fact that they are so hunger stricken, they don’t know me, have just this 1 small pizza to share among BOTH of them for which they have been saving since such a long time, these kids had a heart to share it with me. They might not have a big pocket like many of us but they had a really bigggg heart. I told them to keep having their pizza and hold on with their funny stories ,which they were telling me and I just got up, (recollecting that these two, while taking their order, had asked the price of a choco mousse but having counted their money they had realised that they didn’t have enough of it and had walked away) I went to the counter, bought that tasty choco mousse and gave it to them. The smile on their faces was just inexplicable and their mouths didn’t stop even for a second then until that thing got over. Haha! Some beautiful things happen in the most unexpected times with the most unexpected people! Absolutely touching and inspiring story. Speaks of what a caring person you are too Rikisha! It is the small actions in life that can remind us of the connections we should be making each day. Thank you for sharing. Beautiful . Thank you for being who you are .